Malaysia's GE14: Bread and butter or political issues the key? KUALA LUMPUR (June 17): If life was a movie, there may be indistinct background drumbeats now that are slowly gaining decibels, to herald Malaysia's upcoming 14th general election or GE14. GE14 must be held anytime between now and August 2018. Whenever it is held, many are expecting it to be the mother of all GEs pitting Prime Minister Datuk Seri Najib Razak against his harshest critic and predecessor Tun Dr Mahathir Mohamad, in what is seen as a "classic master vs student showdown", wrote The Edge Malaysia in its latest cover story titled, "GE14: Will it be about the economy? ", for the week of June 19-June 25. Are you one of those thinking that the outcome is unlikely to be different than the past, given that Barisan Nasional -- and its earlier incarnation the Alliance Party -- has held on to power for 60 years now, making it the longest ruling party in the democratic world? Especially with what appears to be a weak opposition? Or are you adamant on change in the face of spiralling cost of living, cuts in education allocation, and irregularities at 1Malaysia Development Bhd (1MDB) and Felda as well as its listed unit Felda Global Ventures Holdings Bhd -- just to name a few -- and confident it can happen? Worldwide trends, wrote The Edge, indicate that populism has been holding sway, with race and religious issues becoming important factors in influencing election results. But at the same time, bread-and-butter matters like unemployment still dominate many campaigns. Political strategist James Carville was credited with coming out with the phrase, “It’s the economy, stupid”, when he advised Bill Clinton to focus on economic issues during the US presidential election in 1992, wrote the weekly. Clinton went on to defeat senior George Bush, whom many had expected to win after the US had successfully defeated Iraq in the first Gulf War only a year earlier. Now, after the shocking UK vote FOR Brexit and Donald Trump's surprise win in the US presidential election -- and not forgetting the more recent snap election in the UK that lost Theresa May the Tories' parliamentary majority -- will Malaysia's GE14 spring any surprises? 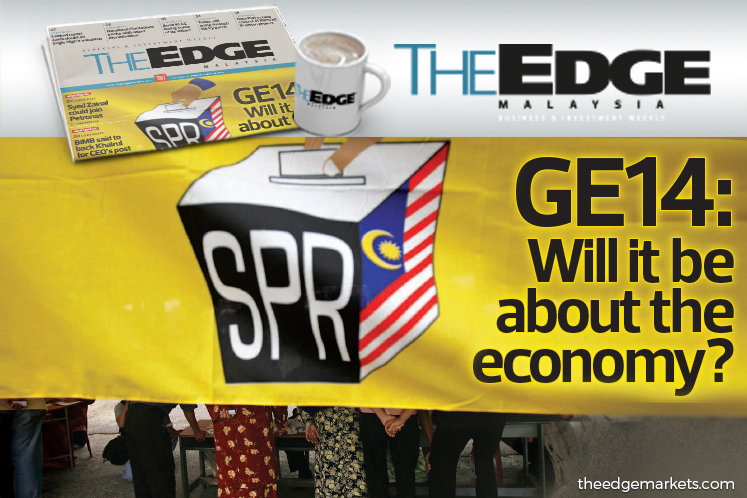 To the ruling BN coalition’s credit, Malaysia has chalked up continued economic expansion in spite of a slew of external factors that have shaken economies globally over the past few of years, wrote The Edge. "The Malaysian economy has managed to weather the volatility in commodity prices, in particular, crude oil prices, expectation of US interest rate hikes and an economic slowdown in China, among others. Malaysia has a good record in managing severe financial and economic downturns such as the Asian financial crisis of 1997-98 and the global recession of 2008," the weekly wrote. In past elections, economic issues have influenced how Malaysians vote, save for the 1999 election when a high number of Malays voted against Umno because of its treatment of former deputy prime minister Datuk Seri Anwar Ibrahim. However, Chinese voters opted for stability then and ensured BN continued its rule. But now, despite efforts such as BR1M handouts, the rising cost of living -- caused in part by the GST, the weak ringgit and cut in subsidies -- is a sore point more than ever. Issues like 1MDB and Felda add to the issues the BN has to grapple with. Among urban Malaysians, 1MDB is seen as an example of mismanagement and corruption at the highest level, the weekly noted. -Former Prime Minister Dr Mahathir: To say he is not happy about 1MDB is probably an understatement. He also highlighted issues that have burdened the people, including GST, unemployment, and the fact that ikan kembung now costs RM18 per kilo. Then there is the poor management of Felda and Tabung Haji, less allocation for scholarships, and Malaysian land and energy assets being sold to foreigners. He said the opposition is not as shaky as it's made out to be, and that they will offer "good governance...the most important thing." -Second Finance Minister Datuk Seri Johari Abdul Ghani: He admitted that 1MDB issue has created an unfavourable perception of the BN government, "but we are surely far from the stage where the government is deemed to have failed in managing the country". -Gua Musang MP Tengku Razaleigh Hamzah: A 60-year Umno veteran who thinks Umno has lost its way and blamed Malaysia's spiralling cost of living on "mismanagement". -Parti Amanah Negara strategy director Dr Dzulkefly Ahmad: He believes the opposition stand a chance even as he admitted that "seat distribution could very well be the Achilles heel of Pakatan". -DAP strategist and MP for Kluang Liew Chin Tong: He is in camp 'maybe' when asked if the opposition's chance is good this time. He thinks that while BN is weak, the opposition is not strong either, with non-Malay support for the opposition having stagnated or softened. -Parti Keadilan Rakyat vice-president and MP for Lembah Pantai Nurul Izzah Anwar: She has "never seen a time when Umno’s [popularity] is at an all-time low" and thinks it's now really "prime for the picking". To read more about what each has to say, including The Edge's take on the situation, pick up a copy of the weekly at news stands near you today.